If a treatment is required within that time period we will re-spray or re-treat for free. SAVE $40 WITH QUARTERLY TREATMENTS. This is our best deal all together. You can pick what service you want with NO CONTRACT. 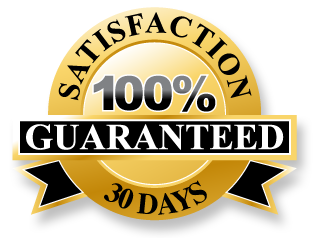 With this service you Are 100% guaranteed from any live bugs and small rodents in your home at any time. Full protection that comes with the service you choose. Initial treatment takes up to 14 days to take full effect. After that time period your 100% guarantee kicks in! This is our best deal when it comes to full coverage of your entire home and yard. With this service we spray all of the eaves and foundation around your home, The interior of your whole home, as well as a 30' yard perimeter outside. This service gives you the best protection from existing pests and is an excellent preventative for future pests. If your home is larger than 4000 SqFt please call us for a specialized quote. This service comes with a 30 day guarantee. If you see a live bug within that time period we will re-spray for free. For a 100% Guarantee we offer quarterly treatments. With this service we spray all of the eaves and foundation around your home and the interior of your whole home. This service gives you full coverage inside your home. With this service we spray your entire yard. This service gives you full coverage for your yard so you, your children, and your pets can enjoy the outdoors without the threat of pesky and dangerous pests. If your yard is larger than a 1/2 acre please call us for a specialized quote. With this service we spray all of the eaves and foundation on the outside of your home. This service is great if you just want a barrier around your home to keep pests out but don't want to spend alot of money. With this service we take care of all mice, rats and vole that have snuggled up inside your home and yard. There is no need to buy any other treatment if these little guys are your only problem. We treat inside your entire home and your full yard. If your yard is larger than 1 acre please call us for a specialized quote. This service comes with a 90 day guarantee. With this service we carefully and safely inspect your entire property for any signs of damage, infestation and traces made by termites. This service is perfect if you are buying a new home, as well as VA home loan inspections. It is also perfect for those who think they have come across a termite or suspect damage from termites in existing homes. We provide a full report when inspection is completed. You will receive a customized report of the inspection that can be turned in if necessary. With this service we supply a full inspection as well as full treatment of bed bugs. Before this treatment we suggest that you vacuum your entire home paying close attention to the baseboards. We also suggest that you wash and dry your bedding on the hottest setting, this will assure the bugs are eliminated from your bedding completely. We use a complete dusting treatment that is specifically made for Bed Bugs, with dusting it doesn't only get in hard to reach places, it also covers all areas that are infested. If your home is larger than 1000 SqFt or you have bed bugs in an odd place like a truck etc please call us for a specialized quote. This service comes with a 3 month guarantee. If you see a live bed bug within that time period we will re-treat for free. With this service we protect your home during the winter months. When dealing with pests it's important to know that they hide in warm places and enter during the cold seasons. It's also important to treat the areas that they enter in. We apply a small amount of specialized dust in the hidden areas such as under the sinks where there is an opening to the interior wall and we go through the electrical outlets of your home to reach the wall voids where they lay their eggs. This service comes with a 30 day guarantee. If you see a live bug within that time period we will re-dust for free. With this service we protect your home from all types of cockroaches. This is a specialized service to target them and stop them in their tracks. This service comes with a 30 day guarantee. If you see a live cockroach within that time period we will re-treat for free. With this service we protect your trees from all types of tree infesting pests. If you have a tree that is starting to die for what seems to be no reason then you probable have tree pests. When dealing with pests that hide inside trees it's important to use a specialized treatment that will protect the tree now and in the future. If your yard is larger than 1/4 acre or you have more than 10 trees please call us for a specialized quote. With this service we protect the outside of your home from wasps. This is a specialized service to target Utah wasps and stop them in their tracks. If your yard is larger than 1/2 acre please call us for a specialized quote. This service comes with a 30 day guarantee. If you see a live wasp within that time period we will re-treat for free. With this service we protect the inside and outside of your home from all types of spiders. This is a specialized service to target Utah spiders and stop them in their tracks. This service comes with a 30 day guarantee for the interior of your home. If you see a live spider within that time period inside we will re-treat for free. With this service we take care of the Box elder bugs that are invading your yard. There is no need to buy any other treatment if these little guys are your only problem. We treat your full yard. With this service we take care of the Ants that are invading your home and yard. There is no need to buy any other treatment if these little guys are your only problem. We treat your full home and yard. This service comes with a 30 day guarantee. If you see any live ants within that time period we will re-treat for free.